Mildred E. Riley, 92 years of Wilmington, passed away on Wednesday October 24, 2018. She was born in Clinton County on June 1, 1926, the daughter of the late Raymond and Veda (Douglas) Moore. Besides her parents, she is also preceded by her husband, Robert Riley, brother, Maynard E. Moore, two nieces, Gayle Moore and Suellen Jenkins and nephew, Roger Walker. Mildred graduated from Sabina High School. Mildred is survived by her sister, Elizabeth Walker of Leesburg, nephew, Randall (Connie) Walker of Leesburg, niece, Patty (Steve) Wilson of Wooster and several great nieces and nephews. A Celebration of Life will be held at Cape May Library, Saturday November 3, 2018 from 1:00pm to 3:00pm. Burial will be at Fayetteville National Cemetery at a later date. To send flowers to the family of Mildred G. Riley, please visit our Heartfelt Sympathies Store. 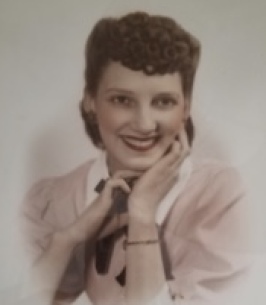 Aunt Mildred was one of the most cheerful souls you could ever meet. She loved clipping comics and sending them to friends and relatives, just to make you smile. I marveled at how she accomplished so much gardening and house cleaning--tasks she enjoyed--while navigating life in a chair. Nothing stopped her--she was truly an inspiration. She and Uncle Bob adored their Dachshunds and I'm sure they are united again with their beloved dogs.